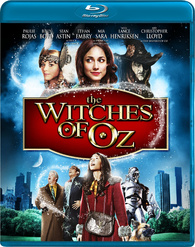 ‘The Witches of Oz’ Blu-ray Announced In an early announcement to retailers, Image Entertainment will release ‘The Witches of Oz‘ on Blu-ray on April 10. The Blu-ray will feature 1080p video, a DTS-HD Master Audio 5.1 soundtrack, and no supplements seem to be included with this release. Suggested list price for the Blu-ray is $29.97. Hillsides “Road to Emerald City” Raises $380,000 for Children and Families Guests to Hillsides annual benefit “Road to Emerald City” followed the yellow brick road to raise $380,000 for programs and services serving vulnerable children and families living in Los Angeles County. On Saturday, February 25, a sold-out crowd was captivated as The California Club in Los Angeles was transformed into the Land of Oz where Dorothy and the Wicked Witch made a special appearance. Adding to the décor, Jacob Maarse Florists donated the floral designs for the evening’s theme. Pasadena resident and event chair Cathy Brennan, dressed in a Goldsmith & Klein strapless, emerald couture ball gown, set the stage for an unforgettable evening. Guests were awestricken by the replica Ruby Slippers worn by Judy Garland in the “Wizard of Oz” previously on loan to The Smithsonian Museum from the Collection of David A. Pacheco that were displayed at the event. Teachers defend their throne at annual outhouse races Teachers from the Pine Ridge and Rosebud Indian reservations defended their throne on Saturday, keeping their title as the fastest team in the Nemo 500 Outhouse Races. 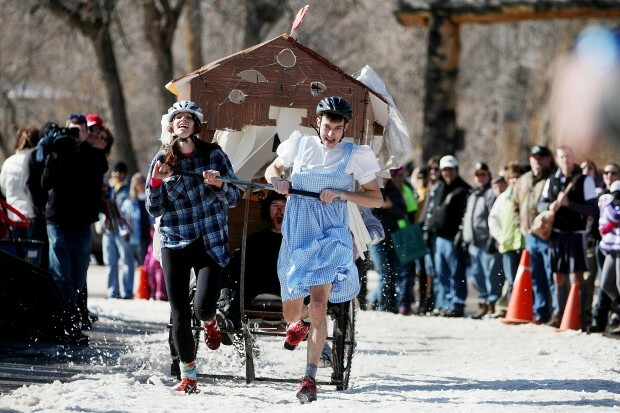 Dressed like Wizard of Oz characters, the five-person crew rolled across the finish line with their outhouse in 2 minutes and 21 seconds. The swiftness of the South Dakota Teach for America teachers, once again, made them the defending champions at the annual event, which was held at Deadwood’s Days of ’76 grounds. Landscape of color grows from black and white In the Alliance’s performance, which opened yesterday, Dorothy wears two dresses, identical in shape. One dress features black-and-white checkered squares. The second dress is blanketed with swirls of yellows, pinks and purples. “Color is the strongest tool we have,” said Sydney Roberts, costume designer for “The Wizard of Oz,” holding up the brightly colored dress next to the rather dull one in the costume shop at the Alliance. “When she opens the door, it says, ‘We are not in Kansas anymore.’ ” Black-and-white imagery is one of the hottest trends in fashion, advertising and the arts. Leonardo DiCaprio buys ‘Wizard of Oz’ ruby slippers for Academy museum In an announcement on Wednesday, the Academy named DiCaprio as the primary benefactor in its acquisition of the shoes, which will eventually be displayed at the planned Academy Museum in Los Angeles. According to a press release, DiCaprio led a group of “angel donors,” including Steven Spielberg and Terry Semel, whose gifts to the Academy Foundation enabled the purchase. Four pairs of ruby slippers were used in the film, but this specific pair is believed to be the primary one used for close-up shots, and in the most pristine condition. 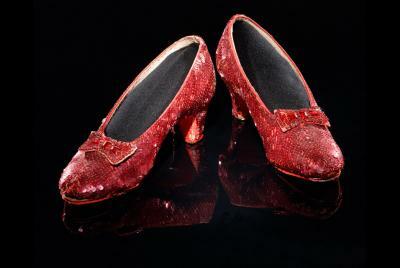 Famously, it is believed to be the pair Judy Garland wore when Dorothy clicks her heels three times to return to Kansas. Professional Collector Gains Right To Sell Merchandise From The Vaults of Hyperion Pictures After one year of jousting with a prominent Hollywood production company, unknown collector, John Chong, represented by Peter Law Group, wins a key legal victory is his quest to share his trove of Hollywood memorabilia with anxious patrons on eBay. The collection purchased by Chong included movie props from the original Wizard of Oz, entertainment industry awards, signed scripts and vintage movie posters. Chong’s valuation expert put the value of the entire collection in the millions of dollars. Director Leigh Scott talks Dorothy and the Witches of Oz In the book, Dorothy had silver slippers, but in the movie they were red to take advantage of the new Technicolor process. The Witch design actually went back to the book quite a bit. The umbrella and eye patch were part of Baum’s original description. But, we really wanted to make things our own and infused a little “steampunk” vibe to the Oz stuff. We also went with clothing and set pieces in our world that looked like they came from the 1930s, to invoke the MGM movie a bit. You can really see that in Eliza Swenson’s wardrobe and hairstyles as well as some of the props. Bravo TV original showstopper has Jewish presence Toronto dentist Harvey Cooperberg and children’s performance group owner Rebecca Sutin are two of the Jewish performers who found the experience beyond memorable. Way Off Broadway details the behind-the-scenes action from the intense auditions, the gruelling rehearsals and the drive necessary to become a united, ensemble cast performing the famous musical classic, The Wizard of Oz. Witches of Oz Spits on L. Frank Baum’s Grave I will just say that the execution (or lack thereof), the sub-par 1980s video-game-esque digital effects, the horrid over-acting by almost everyone in the film and the incredibly slow, dull “please kill me now” pace made this literally one of the worst movies that I have ever seen, and it is definitely the worst project to ever attempt to attach its name to the classic works of L. Frank Baum. Review: No Place Like Home #1 So far, No Place Like Home has all of the elements of a classic. There’s a vibrant cast of characters, a rural setting, suspense, mystery, a decent amount of gore, and even a prophetic drunkard to ice the cake. Richard Jordan’s art, paired with Paul Little’s more neutrally based color palette, the prairies and farmlands of Kansas are captured perfectly. The tornado scene especially has some awesome green tones. The characters are attractive and full of life; their faces are classically drawn, with thicker lines reminiscent of a “pop art” style. Also, there are visual and verbal references to The Wizard of Oz throughout the issue. It’s pretty fun to see if you can catch them all. CSO Presents ‘Oz with the Orchestra’ The CSO is headed to the movies at the Tivoli Theatre on March 3, 2012 in a symphonic night at the movies performance of “Oz with the Orchestra”. The CSO orchestra, conducted by Maestro Bob Bernhardt, will accompany a showing of the classic film The Wizard of Oz. Before the showing, patrons will be able to meet one of the munchkins from the movie. 88-year-old Margaret Pellegrini is one of three surviving Munchkins from the original movie. She appeared in the film as a “sleepyhead” and Munchkin villager. In addition to meeting Mrs. Pellegrini, movie-goers can also have their picture taken with a life-size sculpture of the Tin Man. Created by Kentucky sculptor Stephen Winter, the Tin Man sculpture will be on display in the Tivoli Theatre lobby. The first 1,000 patrons will also receive free Emerald City glasses. 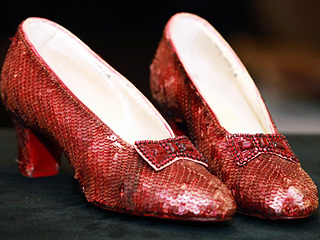 Ruby Slippers Get a Face Lift At Smithsonian The iconic Ruby Slippers worn by Judy Garland in the 1939 MGM film The Wizard of Oz are to be removed from display at the Smithsonian (National Museum of American History). This will take place in February in order to prepare them for a new exhibition called “American Stories,” opening April 5. The slippers are currently on view in “1939” at the Smithsonian’s National Museum of American History through Feb. 22. Oshawa women land juicy roles in TV series – ‘Broadway Boot Camp’ debuts March 2 on Bravo The 13-part Broadway Boot Camp series begins next month, documenting how 21 ordinary Canadians in eight weeks prepare to perform The Wizard in front of more than 1,000 people in Toronto. They give it their all on a short and stressful time-line to get ready for the one-night only stage performance. And Pearce-McKinnon and Oshawa native LeeAnne Rorabeck landed the plum roles, with the latter playing Dorothy. JSP Records to release box set of Judy Garland recordings in 2013 The British label JSP Records will release a box set of Judy Garland recordings in 2013 titled CREATIONS 1936-1962 – SONGS SHE SANG FIRST. The goal of the release is to include tunes Judy Garland was the first to perform. Lawrence Schulman, who was behind such other Garland sets as Child of Hollywood (RPCD, 1993), Judy Garland at the Paris Olympia (Europe 1, 1994), Lost Tracks (JSP, 2010), Smilin’ Through (JSP, 2011), and The Carnegie Hall Concert (JSP, 2012) will compile and annotate the entirely remastered set. No Place Like Home #1 Review While Tirotto and company’s comic features some original uses of the Oz mythology, it fails to warrant further interest. That being said, there is potential for the series to improve over time. It is quite obvious that Tirotto has big plans for No Place Like Home. Fans of the Grimm’s Fairy Tales franchise should give this a look as it offers another dark take on a familiar, literary work. Full List Of 2012 Whatsonstage.com Award-Winners Hannah Waddingham, a previous three-time Whatsonstage.com nominee, scooped Best Supporting Actress in a Musical for her Wicked Witch of the West from The Wizard of Oz, which – with its new songs by Andrew Lloyd Webber and Tim Rice – also collected Best Musical Revival. Follow the Yellow Brick Road Back to ‘Oz’ We incorporated a lot of this subtext, and the basic themes of the Oz books, into our film. Dorothy Gale is a successful writer living in Manhattan. Initially, she believes that her popular books based on the world of Oz are just the product of her imagination. She quickly discovers that her books are based on her childhood memories, and that nothing about her life is what she has been led to believe. In the end, she has to look inside to find the answers and defeat the evil that threatens not only her, but our entire world! Stylistically, we aimed to make the film reminiscent of the great, fun, family-friendly adventures of the 1980s. Basically all those great movies produced by Steven Spielberg at the height of his magic, films like “Gremlins,” “The Goonies” and “Back to the Future.” Plus, we added a little bit of the sass and comedy of “Ghostbusters” (as an inside joke, The Wicked Witch of the West actually lives in “Spook Central”). We cast actors known for their work in that time period, and matched the camera work, musical score, and limited some of our visual effects to make it a perfect complement to my personal favorite era of Hollywood. New ‘Wizard of Oz’ restoration coming — with 3-D to follow? Warner Home Video announced this week that “The Wizard of Oz” is going on a video moratorium in North America on May 1, except for the “70th Anniversary 2-disc DVD,” which will remain on the market until October. New shipments in all formats will then case until the fourth quarter of 2013, when a new digital restoration of the 1939 classic will receive “a multi-platform, unprecedented rollout…with major sponsorships and branding, as well as massive media support.” As I’ve been reporting for years, Warners has long been looking at tests for a 3-D conversion of the 1939 version. The last time I asked, at the premiere of the 70th anniversary restoration at the 2004 New York Film Festival, I was told by executives that the results were disappointingly headache-inducing. Russell’s Wizard night on stage RUSSELL Grant hasn’t stopped dancing since he took part in last year’s Strictly. But his old Strictly friends haven’t forgotten him, and they turned out in force for Russell’s first appearance on the London Palladium stage as the Wizard. 10News Explores Legend Of La Jolla ‘Munchkins’ “According to the legend, they came to live in the Munchkin houses in the late 1930s,” explained Carol Olten of the La Jolla Historical Society.Olten said there are two parts of the legend — why the homes look small and whether the actors really lived in them.Renowned architect Cliff May built four homes in that architectural style in the 1930s.Today, only one home remains on the original street. Alliance Theatre stages ‘Wizard of Oz’ with folk-art bent Set to open next week, the Midtown theater’s version of “The Wizard of Oz” will feature a folk art concept in details large and small — from a Toto made of spools to flying sock monkeys and a found-object Tin Man. “We spent a lovely afternoon going through the High Museum. I did discover the Emerald City in this tiny wind chime,” said Set designer Kat Conley, referencing the museum’s folk art collection. “The whole story is about coming home and finding joy where you are. It’s very much an American story and this is a very American style.” Much of the production is inspired by the work of Georgia artist Howard Finster. Judy Garland’s different shoes in The Wizard of Oz Judy Garland is famous for wearing the ruby slippers, but she also wore different types of footwear during the making of The Wizard of Oz. She wore black shoes in the Kansas farm scenes, and when she arrives in Oz before Glinda gives her the ruby slippers. When her feet was out of camera range, she wore boots, shoes and sandals in order to minimize wear and tear on the ruby slippers and also to make her appear smaller than her friends. Dorothy and the Witches of Oz – Movie Review Scott peppered the film with nods to other movies that helped influence this type of genre. The opening of the film feels very much like The Wizard of Oz, and there are plenty of other moments where you will get a chuckle if you pick up on the reference (such as a taxi driver being referred to as Short Round from the Indiana Jones films or a mention about Planet of the Apes as the flying monkey attack New York City). Bandai debuts the new ‘Dorothy of Oz’ Inspired Toys at Toy Fair The 10” fashion doll seems to be the star of the show. 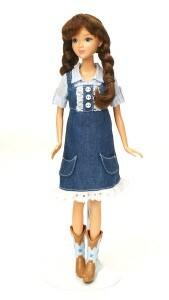 The doll represents the new Dorothy; she still has the same braided pig tails but traded in her cotton dress for denim and her ruby slippers for cowgirl boots. The doll will also feature snippets of songs from the film sung my Michele. She’s more a modern girl but still Dorothy at heart. Some of the most fun toys are the life sized walking and barking Toto doll and an Oz miniature play set. The play set features Emerald City at the center where characters can ride the spinning “Rainbow Mover” into whichever world they desire. Kids can collect other world play sets that attach to the Emerald City. Warner Bros. Putting ‘The Wizard of OZ’ DVDs on Moratorium Until Late 2013 On May 1 WB will stop shipping new DVD and Blu-ray versions of the film, though thanks to existing stock The Wizard of Oz 70th Anniversary Edition 2-Disc DVD will be available until October. Yeah, that’s right — the big 70th edition was just released a couple years ago, but will soon be killed in prep for the 75th. The movie will return to shelves in late 2013. What’s On Walt’s Bookshelves? One of the last projects I was working on for Walt Disney World’s Disney University two years ago, before I was laid off, was to re-create a bookshelf for WDW cast members filled with the books that Walt Disney read. [By the way, once I was laid off, that project died instantly.] I grew up watching Walt’s weekly television show and, while I loved any episode devoted to animation or Disneyland, the one thing that always caught my attention were the bookshelves in his office. Ruth Plumly Thompson autographed a 1934 copy of her Speedy and Oz book to Walt. Not surprising since Thompson was continually pitching that Walt should produce her Oz stories. Also on Walt’s bookshelf was a copy of Who’s Who in Oz by Jack Snow in 1954 also autographed by Thompson at the time Walt was considering making The Rainbow Road to Oz with the Mouseketeers. Dorothy and the Witches of Oz: There’s no place like homage Paulie Rojas is a bold and beautiful up-and-coming actress that stars in the iconic role of Dorothy Gale in Dorothy and the Witches of Oz, which opens in the Valley’s Harkins Theaters on Feb. 17. Paulie (aka Ana Paula Rojas) will be making a special appearance on opening night premiere and is thrilled about the U.S. release of this modern interpretation of the L. Frank Baum classic books. Meet Ms. Rojas at the film’s red carpet premiere event at Harkins Superstition Springs Theater in Mesa, 7:30 p.m. on Feb. 17. Hit the link to buy your tickets in advance. Disney, Warner Bros. Fighting Over ‘Wizard of Oz’ Trademarks On Wednesday, an examiner at the United States Trademark Office suspended Warners’ trademark attempt because Disney had come first. But that’s not the end of the story, if a recent 8th Circuit Court of Appeals decision and lots of activity at the Trademark Office are any indication. Although Baum’s book and accompanying illustrations are in the public domain, judges at the 8th Circuit last year decided to give Warner Bros. “character protection” under its copyright on the 1939 film starring Judy Garland. In the case, which concerned a company that attempted to sell film nostalgia merchandise, the appellate circuit ruled that it would be hard to visualize these characters without watching the movie, even if one had read the book beforehand. Interview with author Elliot Tiber Elliot Tiber, born in 1935, is an interior designer, artist, memoirist, screenwriter, humorist, and activist. He studied at Hunter College in New York, the Pratt Institute in Brooklyn, and at the Sorbonne in Paris. His best-selling 2007 memoir, Taking Woodstock: A True Story of a Riot, a Concert, and a Life (Square One Publishers), written with Tom Monte, was adapted as a movie of the same name by director Ang Lee. The film opened in the United States in August 2009. His follow-up prequel, Palm Trees on the Hudson: A True Story of the Mob, Judy Garland & Interior Decorating (Square One Publishers), was published in 2010.